The Polity come under attack once again, and it’s up to the gen:LOCK team to defend it in their most devasting battle yet. When the first episode of gen:LOCK was released, it opened up with the siege of New York city. It was here that fans got to see the scale of the action the show was preparing them for: aircraft and mechs alike going at it in stunning animation with grand orchestral music in the background and some top class writing from the creators bringing it altogether. In the sixth episode, ‘The Only Me I Know’, the audience is treated to a similar sequence of events, where the gen:LOCK recruits test their strength against a full frontal attack from the Union. However, this will be the hardest test for the team yet. ‘The Only Me I Know’ opens up with the Vanguard squad returning home after the previous episode’s events. The rest of the military are acting cold towards the gen:LOCK team, as they realize Nemesis is chockingly similar to Dr Weller’s tech, as well as the pilot fighting and talking like Chase. Back at the base, after being confronted by Miranda, Chase goes to Dr Weller to get some answers and discovers that Nemesis is gen:LOCK tech and the pilot is a copy of Chase’s mind. He doesn’t have a lot of time to process this information before the Union attack the Vanguard base, led by Nemesis and followed by a behemoth walker carrying Union forces. Throughout the episode, the Vanguard struggle to defend against the Union’s siege, taking significant losses and the Union getting as far as entering the base, causing Dr Weller to tell the gen:LOCK to download from the machines and run. The Vanguard continue to put up a good defence and finally bring down the behemoth. When it seems the battle is finally won, the wrecked walker releases a cloud of nanomachines, leaving everyone inside the base presumably dead or captured, while the gen:LOCK team escape with their tails between their legs. There is a lot to take in visually in ‘The Only Me I Know’. The animation continues to look stunning: with the Union attacking the Vanguard at their front door, the heroes of the show are fighting for their lives and the animators do not let up until the battle’s conclusion. The episode is just filled with adrenaline, and with the stakes being so high, is probably the most exciting episode since the pilot. One scene of animation in particular stands out: at one point, Kazu seems to be overwhelmed by Union forces and Valentina connects with his Holon, helping him destroy is enemies in a scene that can only be described as a warrior’s dance, going between Kazu and Val’s avatars in the Holon’s mind to the battle in real life. With the conflict of the two Chases becoming a subplot of the episode, Michael B. Jordan gets much more of a speaking role in this episode. Despite being shown as the main character, it often felt like other characters got more screen time, so it’s nice to see the actor get some of the spotlight. Before the battle, Nemesis contacts the Vanguard and says he wants to be complete again. Whenever he confronts the protagonist Chase, he cries ‘DESTORY THE COPY!’. However, despite how the episode is portrayed, is it possible that Nemesis’s pilot is the copy while gen:LOCK Chase is the real one? Whenever Nemesis speaks, his voice is corrupted and Nemesis’ movements are jittery and janky, while Chase’s Holon moves smoothly, and Chase’s avatar speaks without any problems. ‘The Only Me I Know’ shows us a little bit of relationship development between Yasamin and Dr Weller. Though these characters were introduced at the same time, their relationship has mostly been left hidden from the audience. However, when Dr Weller is trying to get the gen:LOCK team to run, he turns to Yasamin and says ‘Time to fly, little dove’ before kissing Yasamin on the forehead, which begs the question: what do these characters mean to each other? Lovers? Adopted family? We also see some relationship development with the gen:LOCK team and their trainers. Upon returning to the base, the captain tells them they are to be debriefed, which annoys the recruits. When Kazu suggests that they should celebrate their first victory, he is again shot down by the captain, leaving their interaction on a tense note. However, during the gen:LOCK teams escape, they come across an area of the barracks where the trainers organized a surprise party. Though it doesn’t add a lot to the overall plot, it is nice to see some emotional development between the gen:LOCK team and the rest of the Vanguard. Watching the Union forces penetrate the base is interesting. 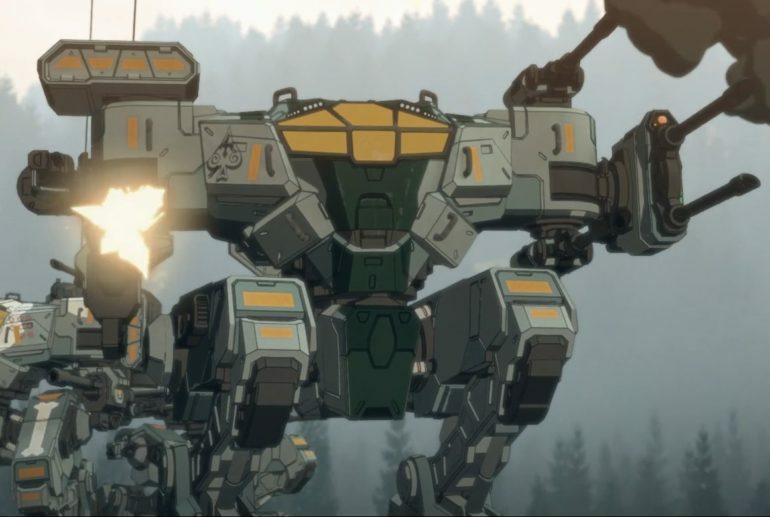 Gen:LOCK continues to draw influences from other sources: the Union drones which first enter the base act like the drones from the Mutant Year Zero trailer. Also, when the Union forces break into the gen:LOCK computer control and are about to capture Dr Weller, he sets off an explosive. The camera cuts away and the audience is left to assume that the doctor committed suicide to save the team. However, even before it goes off, the bomb releases a sphere of energy that doesn’t seem to affect him. It’s more likely that this is some kind of EMP (Electro-Magnetic Pulse) weapon Weller used to disable the Union forces – who rely heavily on technology – and fry some of the gen:LOCK tech to keep it out of enemy hands. It is hard to believe that the creators of the show would kill off one of the main characters so early on. Though the ending of the episode is dramatic and gut wrenching for the fans, as a shocking twist it feels like stuff the audience might have seen before, like the Red Wedding in Game of Thrones or the ending of Star Wars: The Empire Strikes Back. It also feels played a little too soon, as most shows use the first few episodes to set up future events while this show goes straight for the drama. To return to the Dr Weller argument, although the episode concludes with the fate of the Vanguard forces left in the dark, it’s doubtful that the creators will kill off this many main characters so early in the show. Instead, it’s more than likely that it’ll be a future storyline where the team organise a rescue mission. With all that being said, it is still hard hitting for fans to watch. Again, much like the pilot, the original music that is played as the nanomachines is hauntingly gorgeous piece of music, reflecting the sadness of the gen:LOCK team as they leave their allies to an unknown fate The camera work is well shot, especially with Chase standing on top of the base trying to contact his allies as he watches the base being consumed. It is both beautiful and hollowing, as fans are left wondering what comes next for the heroes. Check out our previous gen:LOCK reviews here. ‘The Only Me I Know’ is the strongest episode of gen:LOCK so far. While there is less witty writing in comparison to previous episodes, this is the height of the story’s drama, with strong action and an ending that will leave fans stunned.